Vegan Green Bean Casserole is a staple to any plant-based or health-conscious holiday table. Thanksgiving, Christmas, or just any old day. In a large oven-safe skillet, melt vegan butter over medium heat. Add diced onion, salt, and pepper, and cook for 2-3 minutes, until translucent. Add in mushrooms and cook for another 3-4 minutes. Once mushrooms have cooked down a bit, sprinkle flour in and mix to coat, cooking for about a minute. Slowly whisk in the vegetable stock and almond milk. Add herbs de provence and a little more salt and pepper to taste. Simmer on low to thicken. Once thickened, add in green beans and half the fried onions. 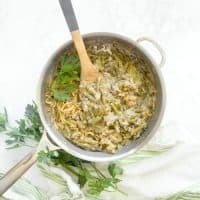 Once mixed, topped with remaining fried onions and bake in the oven for about 15 minutes, until sauce is hot and bubbly and the onions have browned a bit on top.